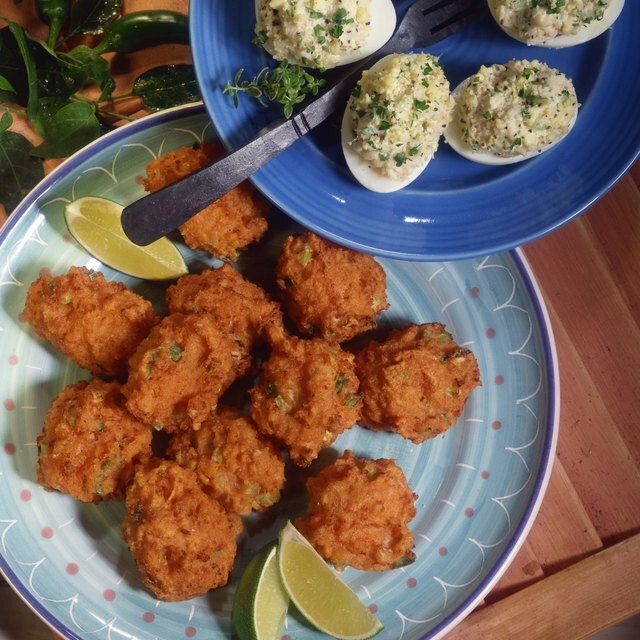 Can I Substitute Ranch for Mayo in Deviled Eggs? How Much Milk, Eggs & Flour Do I Use for Fried Chicken? 1 Can I Substitute Ranch for Mayo in Deviled Eggs? 2 How Much Milk, Eggs & Flour Do I Use for Fried Chicken? 3 How Long Should a Pancake Cook on Each Side? Don't let the the only caramel corn you know come from tins sold at fundraisers. Homemade versions of this addictive snack elevate the flavor and texture, so it's good enough to wow friends at your next cocktail party or please the kids on a fall afternoon. A batch takes a little over an hour to finish, but the results are well worth it. Use fresh kernels and pop them the old-fashioned way -- on the stove in a light layer of oil. Use a deep, heavy pan that has a tightly fitting lid, and pour enough vegetable oil in to create a light film on the bottom. Top with a single layer of popcorn kernels, cover and listen. When you hear the kernels begin to pop, hold the handles of the pot and shake it side to side to prevent the kernels from burning. As soon as the popping slows down, remove the pot from the heat. Use this freshly popped corn rather than resorting to bags of microwave popcorn, which contains chemicals and flavorings that could negatively alter the taste of your finished product. Air-popped popcorn is also not ideal -- you'll end up with chewy puffs that don't hold up well to the caramel sauce. A classic caramel sauce calls for unsalted butter and brown sugar, which, when combined, give the corn a deep, rich flavor. Melt the butter in a saucepan over low to medium heat and add the brown sugar -- about one cup for every 1 to 1 1/2 sticks of butter. You'll bring the sugar and butter to a boil while stirring constantly. Keep it boiling until your caramel is about 250 to 350 degrees F. If you don' t have a candy thermometer, let it boil for about three minutes. Don't panic if it goes longer -- you'll just end up with crunchier caramel corn. Stir in a splash of vanilla, less than a teaspoon of baking soda and a pinch of salt. You may opt to add up to 1/2 cup of light or dark corn syrup or a few tablespoons of agave nectar to thin out the syrup and make it sweeter. In a large, oiled bowl, stir together the caramel sauce and the popcorn. Add peanuts or mixed nuts to the mixture for added crunch and flavor. Once the popcorn is evenly coated, spread it in a single layer onto a greased baking sheet. Bake at 250 degrees F for 45 minutes to one hour. If you'd prefer to avoid clumps of corn, stir the batch every 15 minutes or so to break them up. Once the caramel corn is cool, you're welcome to indulge. If you end up with leftovers, store it in an airtight container for up to a week. 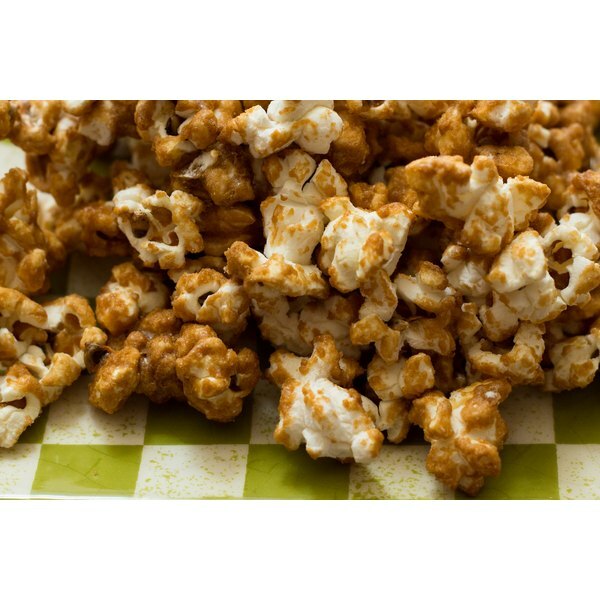 An advantage to making your own caramel corn is that you can experiment with flavorings. "Food and Wine," for example, makes a decidedly adult caramel corn by adding a few tablespoons of tequila to the caramel sauce. Slightly increase the amount of salt in the caramel to make a salted caramel corn, and lightly sprinkle the finished product with crystals of sea salt. A teaspoon or two of curry and cayenne spices added to the caramel sauce add surprising flavors to the batch. If you have a craving for old-fashioned Cracker Jack, add a couple tablespoons of molasses to the caramel sauce before mixing it with the popped corn.